OKLAHOMA CITY—Just hours after Kevin Durant mailed in his forms for 2010, a conversation with Thunder teammate Russell Westbrook Monday made him realize he had forgotten to deduct the results of some 600 dunks. 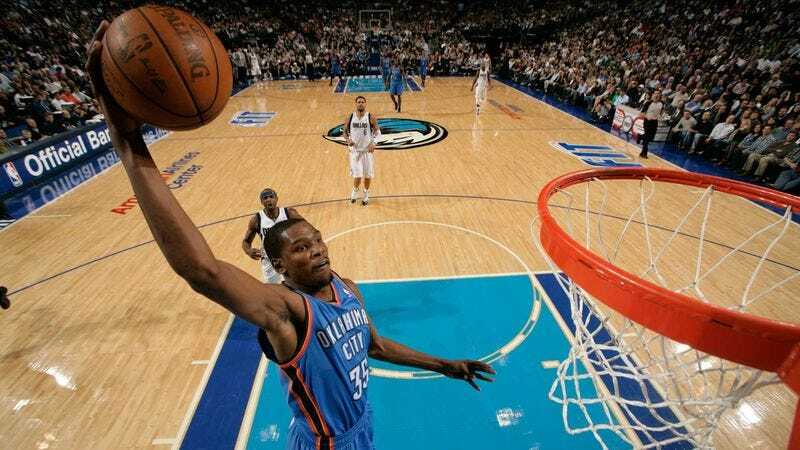 "Russell was talking about how he was able to get almost 60 percent back from dunks, and I was just stunned I'd forgotten to put down any at all," said Durant, who noted that he could have received substantial dunk-related refunds, as even dunks made while ahead by more than 10 points could be counted as necessary entertainment write-offs. "I mean, even Serge [Ibaka] remembered to list all his jams, and he's from the Congo." Durant said he had intended to make the deductions, keeping each of his dunk receipts, but had gotten sidetracked by the pressure of filling out his and-1 forms by the April 18 deadline.